Being a parent is tough. Being a mother who can’t move her arms and legs seems insurmountable, but Joni Vanderwolde of DeMotte, IN isn’t dwelling on her limitations. Just two years after a car accident that caused quadriplegia, Joni married her high school sweetheart. Four years after that, the couple began trying to have children. Pregnancy for women with paralysis is rare. Vanderwoude, who gave birth at Northwestern Memorial’s Prentice Women’s Hospital, is the only mother with quadriplegia her doctor has treated in the last decade. Carrying babies in a paralyzed woman’s already challenged body comes with risks, including dangerous blood clots and high blood pressure. But generally, pregnancy and paralysis have little to do with each other. A woman can easily conceive and carry a baby to term – even with a spinal cord injury. During each of her deliveries, specialists were on hand, including hematologists, cardiologists and anesthesiologists who were fully aware of the potential complications related to paralysis. 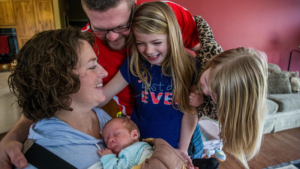 Doctors and spinal cord injury researchers say Vanderwoude is a great example of how advances in fetal medicine, adaptive technology, social media and specialty websites have made it easier for women with paralysis to experience motherhood. She has just given birth to her third child. She has learned to rely on caregivers and her older children for changing diapers or finding lost comfort items. 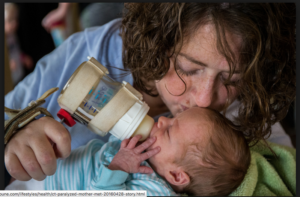 She’s also been able to find a way to feed the baby every two hours — even through the night — with her own breast milk. Sometimes, her husband or an aide positions Zachary on her lap to breast-feed directly. Other times, Vanderwoude gets help using a breast pump for bottle-feeding. Thank you for this inspiring story. I am a resident physical rehabilitation in the Netherlands. I am researching prevalence of parenthood in SCI men and women in the Netherlands. I will present a poster at the ISCoS in Vienna in 2016. For this poster I would like to use a picture of a mother with SCI and her child. I really like the picture you made of Joni vanderwolde with her baby. It is just so real and shows the possibilities for women with a SCI. Is it possible to get in contact with the photographer or Joni vanderwolde to ask if I could use this (or another) picture for my poster? vortiz@chicagotribune.com – see if she can help. Good luck!